This recipe, from Cook’s Illustrated April 2013, is definitely a winner. The other recipes I’ve tried were bland or ketchuppy, while this one had lots of flavour, and no ketchup. Real pad thai doesn’t contain ketchup, so don’t be tempted to substitute, no matter how many recipes you see online for pad thai with ketchup. The real ingredient is tamarind paste or concentrate; I got mine in Mexico, but I’ve seen it in Vancouver in Filipino shops. If you’re in Vancouver I’ve heard you can also get it at T&T and Famous Foods. 1. If you are using the tamarind PASTE you need to let it soak for about 10 minutes, then run it through a fine-mesh sieve to remove the fibres. I used the CONCENTRATE, so it was easier; I just had to add the boiling water. Stir in the rest of the sauce ingredients and set aside. 1. Bring a large pot of water to a boil. Remove it from the heat and let the noodles sit in the hot water for about 10 minutes, until softened but not mushy. Drain the noodles and set them aside. 2. Toss the shrimp with 1/8 teaspoon each of salt and pepper, and a pinch of sugar. Heat a tablespoon of oil in a large frying pan. Add the shrimp in a single layer and cook without stirring for about a minute, then flip them over and cook for about another 30 seconds. Transfer the shrimp to a bowl with a cover and set aside. 3. Add a tablespoon of oil to the pan along with the garlic, shallot, and 1/8 teaspoon of salt, and cook on medium heat until they are golden brown. Add the eggs and cook while stirring constantly for about 20 seconds, and the eggs are barely moist. 4. Toss in the drained noodles, then add the sauce. Increase the heat to high and cook while tossing the noodles constantly for about one minute, until the noodles are evenly coated. Add the bean sprouts, peanuts, and all but 1/4 cup of scallions. Continue to cook, tossing constantly for about 2 minutes, or until the noodles are tender. 5. Add the shrimp and tofu to the pan and cook until heated through, about 30 seconds. 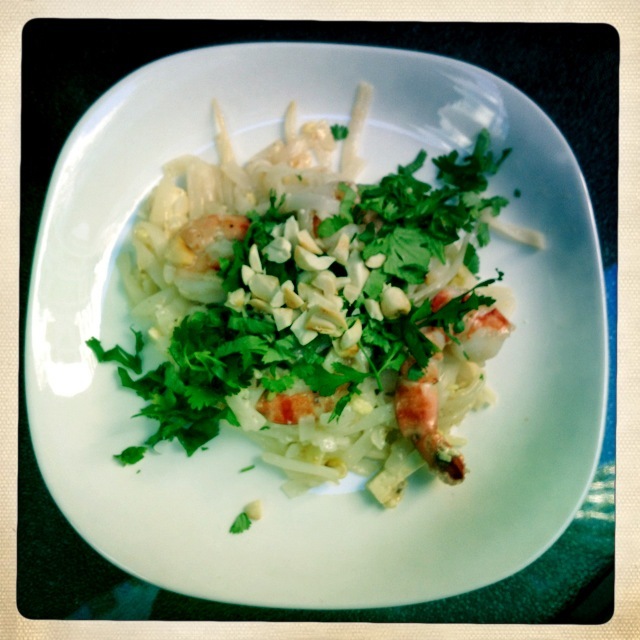 To serve, put the noodles on a large platter and garnish with the remaining scallions, peanuts and cilantro. Serve with lime wedges. Posted in gluten free, lactose-free, Main Dishes, Uncategorized	gluten-free mealsgluten-free recipeslacttose-free mealspad thai recipepad thai recipespad thai with no ketchuppad thai with shrimppad thai with tamarindpad thai with tofuwhere can I buy tamarind paste in vancouver?